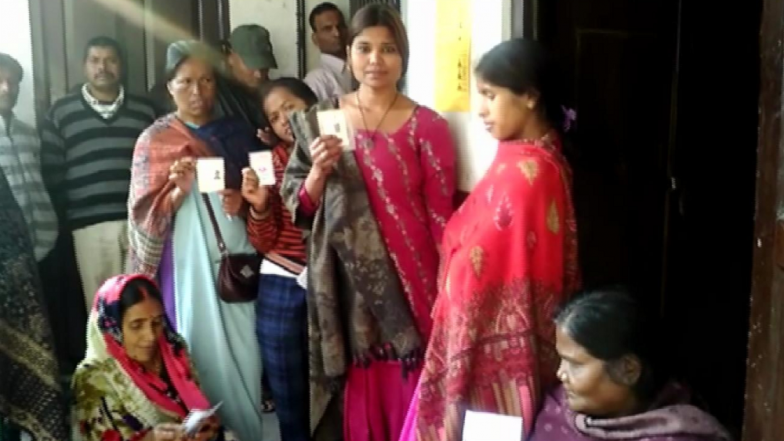 Shillong, April 11: Nearly 45 per cent of the total 19,14,795 electorate have cast their ballots in the first seven hours of polling for the two Lok Sabha seats in Meghalaya on Thursday, an election official said. Since voting began at 7 a.m., 44.50 per cent of voter turnout was recorded in both the Shillong and Tura parliamentary constituencies, the state's Chief Electoral Officer Frederick Roy Kharkongor said. In the 2014 Lok Sabha polls, the voter turnout was around 62 per cent in Shillong and around 70 per cent in Tura. Chief Minister Conrad Sangma voiced confidence that candidates of the ruling Meghalaya Democratic Alliance (MDA) government will win both the seats. The MDA has fielded former Union Minister National People's Party (NPP) nominee Agatha Sangma from Tura and former United Democratic Party (UDP) legislator, professor Jemino Mawthoh from Shillong. Meghalaya Lok Sabha Elections 2019 Schedule: Complete Dates of Voting And Results For General Elections. "We are very confident that both Agatha and Mawthoh will win this election as people have reposed faith in the government," Conrad told IANS after casting his vote. Both Mawthoh and Agatha Sangma, the sister of the Chief Minister and the youngest daughter of late Lok Sabha Speaker Purno Agitok Sangma, will contest on symbols of their own party's - the UDP and the NPP, respectively. Mawthoh is fighting to unseat two-time MP and former Union Minister Vincent Pala from Shillong seat, which is considered a traditional Congress seat. Sitting BJP legislator Sanbor Shullai and three Independents - T.H.S. Bonney, Romeo Phira Ranee and Samuel Hashah -- are the other contenders from Shillong.